^ Kurylowicz, Jerzy (1927). 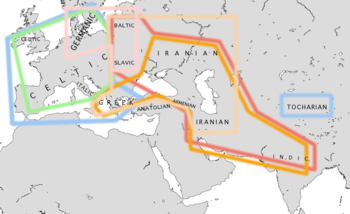 "ə indo-européen et ḫ hittite". In Taszycki, W.; Doroszewski, W. (eds.). Symbolae grammaticae in honorem Ioannis Rozwadowski. 1. pp. 95–104. ^ Watkins, Calvert (1966). "Italo-Celtic revisited". In Birnbaum, Henrik; Puhvel, Jaan (eds.). 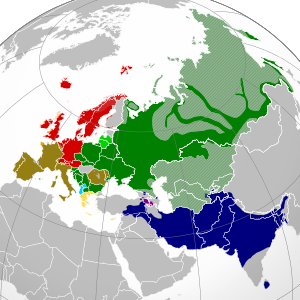 Ancient Indo-European dialects. Berkeley: University of California Press. pp. 29–50. ^ Weiss, Michael (2012). Jamison, Stephanie W.; Melchert, H. Craig; Vine, Brent (eds.). Italo-Celtica: linguistic and cultural points of contact between Italic and Celtic. Proceedings of the 23rd annual UCLA Indo-European Conference. Bremen: Hempen. pp. 151–73. ISBN 978-3-934106-99-4. Retrieved 2018-02-19. ^ Holm, Hans J. (2008). "The Distribution of Data in Word Lists and its Impact on the Subgrouping of Languages". In Preisach, Christine; Burkhardt, Hans; Schmidt-Thieme, Lars; et al. (eds.). Data Analysis, Machine Learning, and Applications. Proc. of the 31st Annual Conference of the German Classification Society (GfKl), University of Freiburg, March 7–9, 2007. Studies in Classification, Data Analysis, and Knowledge Organization. Heidelberg-Berlin: Springer-Verlag. ISBN 978-3-540-78239-1. The result is a partly new chain of separation for the main Indo-European branches, which fits well to the grammatical facts, as well as to the geographical distribution of these branches. 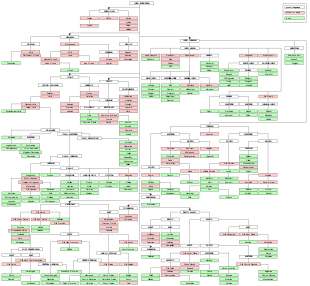 In particular it clearly demonstrates that the Anatolian languages did not part as first ones and thereby refutes the Indo-Hittite hypothesis. Holm, Hans J. (2008). "The Distribution of Data in Word Lists and its Impact on the Subgrouping of Languages". In Preisach, Christine; Burkhardt, Hans; Schmidt-Thieme, Lars; et al. (eds.). Data Analysis, Machine Learning, and Applications. Proceedings of the 31st Annual Conference of the German Classification Society (GfKl), University of Freiburg, March 7–9, 2007. Heidelberg-Berlin: Springer-Verlag. ISBN 978-3-540-78239-1. Renfrew, C. (2001). "The Anatolian origins of Proto-Indo-European and the autochthony of the Hittites". In Drews, R. (ed.). Greater Anatolia and the Indo-Hittite language family. Washington, DC: Institute for the Study of Man. ISBN 978-0-941694-77-3.